Spanish Silver Cob, "Piece of Eight", from Shipwreck Rooswijk. 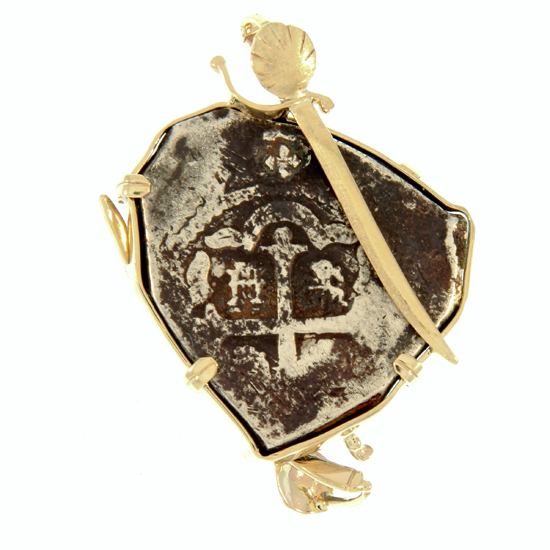 Handmade 14Kt yellow gold reversible frame features replicas of Dutch swords from the early- to mid-1700s. Wreck dated 1739. Coin dated 1730. Obverse: Castles and Lions quarted by cross with legend around. Reverse: Bourbon shield, Mint and Assayer's mark.surrounded by legend with Date. Certificate of Authenticity. 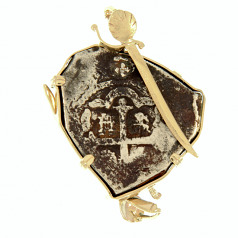 Dimensions: Coin- 1-1/4' x 1-1/8" Pendant: 2" x 1-1/4"
The Rooswijk was a 145 ft. 850 ton retour ship owned by the Dutch East India Company (also known as the VOC). The main purpose of the voyage was to purchase items such as spices, textiles, porcelain, pepper and tea. These commodities made the Dutch East India Company the most powerful corporation in the 17th century. In December 1739, in the roads off the Northern Dutch Islands of Texel, the Rooswijk began preparations for her second voyage to the Indies by taking on cargo, crew and passengers. 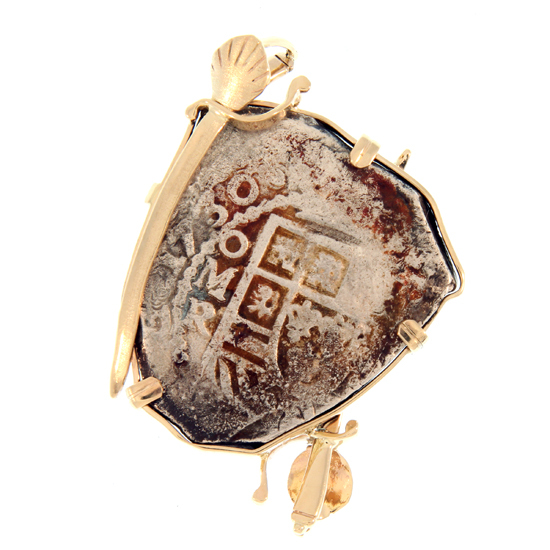 Treasure was loaded under the careful supervision of accountants and officials of the Dutch East India Company. There were ten chests containing silver coins (primarily minted in Mexico between 1720 and 1738) and twenty chests containing 1,000 silver bars. Each chest, wrapped in canvas and tied with rope, was then taken to the Captain’s cabin where it was sealed with red wax and signed off the accountants’ ledgers. On December 18, 1739, Captain Daniel Ronzieres set sail for Batavia, along with three other ships in what was known as the Christmas Fleet. The voyage would not last long. Just one day after leaving Texel, the Rooswijk was caught in a heavy storm. The ship struck the Goodwin Sands off the southeast coast of England. The Goodwin Sands was also known as “the ship-swallower” because of its shifting sands and strong currents. The weather was so bad that boatmen from the towns of Deal and Ramsgate (experts in salvage and rescue) were unable to launch their boats to look for survivors or cargo. There were no survivors. Only a small amount of cargo, including a box containing documents identifying the ship as the Rooswijk, washed up on shore. Any chance of salvage was impossible because of continued bad weather. The loss of the Rooswijk was a financial disaster for the Dutch East India Company. A replacement ship and treasure had to be sent because the Company could not afford to lose any trading profit they would make on the goods purchased in the Indies. Even though a reward was offered for any salvage from the wreck that was surrendered, little was ever recovered. The Rooswijk and its treasure would remain under several feet of sand for 265 years. In 2004, Ken Welling found evidence of shipwreck debris while diving on the Goodwin Sands. Over the next few months he recovered 535 silver bars, two complete chests and a small number of artifacts. A carbine bearing the arms of the city of Amsterdam and a pillar dollar dated 1735 convinced him he had located the wreck of the Rooswijk. By 2005, under the direction of the recovery became an archeological “rescue” and all items were surveyed and catalogued for future research.